(1) GORGEOUS ART. After yesterday’s link to a website that posts a hideous sf book cover every day, it’s time to balance the score. 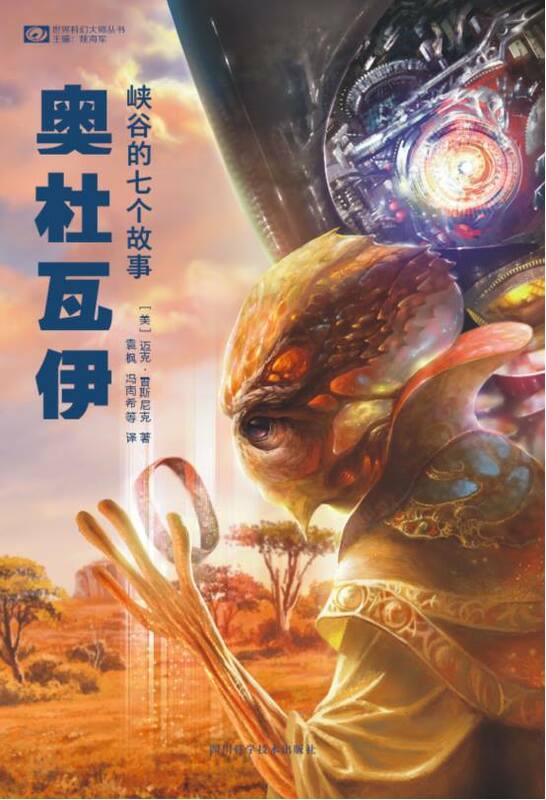 On Facebook, Mike Resnick shared the beautiful cover of the Chinese edition of Seven Views of Olduvai Gorge, a collection which uses his story as the title. Just this morning I realized how very grateful I am to have what I had thought to be a minor character in a novel blossoming into something unexpected…..
(3) THE END IS NOT NEAR. Cartoon Network’s Adventure Time is scheduled to go off the air – eventually. (4) RIDDLE NOVEL. Departure. A time travel mystery thriller romance. Out this month in paperback from A.G. Riddle, author of the Origin/Atlantis trilogy. Described as Quantum Leap meets Bridget Jones’ Diary. En route to London from New York, Flight 305 suddenly loses power and crash-lands in the English countryside, plunging a group of strangers into a mysterious adventure that will have repercussions for all of humankind. Struggling to stay alive, the survivors soon realize that the world they’ve crashed in is very different from the one they left. But where are they? Why are they here? And how will they get back home? Five passengers seem to hold clues about what’s really going on: writer Harper Lane, venture capitalist Nick Stone, German genetic researcher Sabrina Schröder, computer scientist Yul Tan, and Grayson Shaw, the son of a billionaire philanthropist. As more facts about the crash emerge, it becomes clear that some in this group know more than they’re letting on—answers that will lead Harper and Nick to uncover a far-reaching conspiracy involving their own lives. As they begin to piece together the truth, they discover they have the power to change the future and the past—to save our world . . . or end it. A wildly inventive and propulsive adventure full of hairpin twists, Departure is a thrilling tale that weaves together power, ambition, fate, memory, and love, from a bold and visionary talent. (5) POP WARFARE. Stephen Dedman’s May the Armed Forces Be with You: The Relationship Between Science Ficttion and the United States Military is out from McFarland. Dedman is a lecturer in creative writing at the University of Western Australia and the author of five novels and more than 100 short stories. Science fiction and the United States military often inhabit the same imaginative space. Weapons technology has taken inspiration from science fiction, from the bazooka and the atomic bomb to weaponized lasers and drones. Star-spangled superheroes sold war bonds in comic books sent to GIs during World War II, and adorned the noses of bombers. The same superheroes now appear in big-budget movies made with military assistance, fighting evil in today’s war zones. A missile shield of laser satellites—dreamed up by writers and embraced by the high command—is partially credited with ending the Cold War. Sci-fi themes and imagery are used to sell weapons programs, military service and wars to the public. Some science fiction creators have willingly cooperated with the military; others have been conscripted. Some have used the genre as a forum for protest. This book examines the relationship between the U.S. military and science fiction through more than 80 years of novels, comics, films and television series, including Captain America, Starship Troopers, The Twilight Zone, Dr. Strangelove, Star Trek, Iron Man, Bill the Galactic Hero, The Forever War, Star Wars, Aliens, Ender’s Game, Space: Above and Beyond and Old Man’s War. (6) EARWITNESS TO HISTORY. At ThePulp.Net you can listen to a recording of Ted White’s PulpFest guest of honor speech. Ted White, science-fiction author and editor of Amazing Stories from 1968 through 1978, discussed his career in writing and editing. His presentation was recorded on Saturday, July 23, at PulpFest 2016. (7) MILESTONE ISSUE. Clarkesworld Magazine’s 10th Anniversary Issue is now online. Congratulations to Neil Clarke and the staff! (8) STUDYING THE IMPOSSIBLE. In “A Nonlinear History of Time Travel” by James Gleick in Nautilus, Gleick, in an excerpt from his forthcoming book Time Travel: A History, gives a look at time travel paradoxes, but also explains that Robert Heinlein’s classic story “All You Zombies—” was not only pioneering transgender sf, but very accurate physics. (9) WEIR CRITIQUES MUSK. Andy Weir on Elon Musk’s Mars plans. You could say Weir had already thought about this a little bit: “The Martian’s Andy Weir talks to Ars about the science if Musk’s Mars vision”. Musk’s rockets are methane-powered, and, as John Timmer discusses in detail, creating methane on Mars actually isn’t complicated. Take some carbon dioxide from the atmosphere, mix it with hydrogen (which you can crack out of water molecules, which Mars has in surprising abundance), add energy, pressure, and a catalyst, and boom, you’ve got methane and water. In the movie The Martian, a mighty sandstorm leaves astronaut Mark Watney stranded on Mars after high winds rip out an antenna and destroy most of his camp. That scene was a little exaggerated. Because Mars’s atmosphere is so thin, 60 mph winds don’t produce nearly as much force as they do on Earth. But sand and dirt on Mars is definitely a problem. Mars periodically gets massive sandstorms that spread out across the planet and can last for days or weeks at a time. You don’t want to be outside in one. All those little particles flying around could conceivably tear a hole in your spacesuit. Or, more prosaically, they could clog door seals, mess up machinery, or even cover up solar panels, depriving astronauts of power for extended periods. A related concern is the fact that Martian soil is toxic. It contains very high concentrations of perchlorates — salts that can do serious damage to the human thyroid gland. “If your backyard had as much perchlorate as Mars does, it’d be a Superfund site,” McKay says. It’s okay to touch Martian dirt with your bare hands. But you really don’t want any to get into your drinking water or food when you tramp it into your habitat. You also don’t want to grow plants using Martian soil. McKay also brought up another related risk: Right now we’re pretty sure there’s no life on Mars, no strange microorganisms lurking in the soil. But we’re not absolutely sure. So it might be a good idea to test out any proposed landing site in advance, in case there’s anything harmful lurking. And that worry goes both ways: We’ll want to be careful about contaminating or killing any Martian life, too. The 1967 Outer Space Treaty forbids the “harmful contamination” of alien worlds with our earthly microbes. October 1, 1968: Night of the Living Dead has its first screening in Pittsburgh. October 1, 1974: Dallas hosts the premiere of The Texas Chain Saw Massacre. (12) AXANAR SUIT CONTINUES. CinemaBlend reports “The Star Trek Lawsuit Is Trying To Pull J.J. Abrams And Justin Lin In Deeper”. Last December, the producers of a Star Trek fan film, Star Trek Axanar, were hit with a lawsuit from Paramount after they raised $1 million for funding from Kickstarter and Indiegogo campaigns. Many fans were upset that the studio was citing copyright infringement after years of the fan films being released without any problems, and eventually, J.J. Abrams and Justin Lin, directors of the reboot movies, became involved, and Abrams implied that the lawsuit would go away. Well, it didn’t and now both men could find themselves pulled deeper into this legal mess. For those who need a refresher, last May at the Star Trek Fan Event, J.J. Abrams told attendees that he and Justin Lin had spoken with paramount bigwigs and “pushed them to stop this lawsuit.” He then said there would be an announcement in the coming weeks of the lawsuit “going away,” but in June, it was confirmed that Paramount is still seeking to continue with it. Now THR has learned that Axanar Productions has brought forward a motion to compel discovery, and one of the things it demands is to learn what Paramount discussed with Abrams and Lin about the lawsuit and fan films in general. This entry was posted in Pixel Scroll and tagged A. G. Riddle, Andy Weir, Axanar, Clarkesworld, Elon Musk, J.J. Abrams, Mars, Mike Resnick, Pulpfest, R. A. MacAvoy, Star Trek, Stephen Dedman, Ted White by Mike Glyer. Bookmark the permalink. sacrificial 3 or 4 ::tickbox::? Somehow, I’m plugged into WordPress to the extent that I don’t even have to check the tickybox to get comments. The notification of this post just appeared in my inbox and it already had three comments on it. Apparently I didn’t actually :;ticky::! Ugh, this sounds just like Lost. I hope Riddle does a better job with it. The link text in (9) has a weird error. David Goldfarb: The link text in (9) has a weird error. So it does. Thanks for catching that. Appertain yourself the beverage of your choice! (12) AXANAR SUIT CONTINUES. On and on it goes! Interesting that J.J. Abrams and Justin Lin were trying to make it go away, and instead it’s dragging on more in part because of their statements. Finished watching Flying Witch last night. It was a cute, funny, gentle little pastoral fantasy slice-of-life. One of my favourite episodes features a visit to a passing flying whale. We also learn that Akane’s feline familiar studies anthropology. Second T! — (5) “Science Ficttion” — Stands for Tickbox. Back a few scrolls ago, there was some discussion going on about cultural appropriation and whether it was right and proper for WSMs to write characters who are PoC and/or LBQT, or whether that’s best left to actual PoC and/or LBQT authors. Yesterday I had to go out in the garage/library to try and find a particular book, and found one of the boxes in the stacks of boxes containing old fanzines had fallen off and onto the floor, spilling the contents. Picking up the scattered fanzines, I found one was an old apazine of mine from 1991. And sunnuvagun if I wasn’t commenting about the same issues back twenty-five years ago. Goes to show my opinions have a less than negligible effect on society, I guess. Not trying to restart the discussion here, just a little bemused that some of the people involved in the current discussion were probably toddlers, or not even born, back in 1991. And maybe a little disappointed that the discussion is still going on a generation later. Short version: Damn, I’m getting old. @Bonnie McDaniel: Are you perhaps conflating “notify me of new posts” and “notify me of follow-up comments”? If you’re just getting a single e-mail for each new post, about when it comes out, then it sounds like one time, you checked the “notify me of new posts” box (and then confirmed it). I frequently find this checked by default (sigh), but I uncheck it (or don’t comfirm) because I don’t want these. But the comments e-mails come individually, as in, literally one e-mail per comment, labelled as such. Are you getting one e-mail per comment? It doesn’t sound like it. But maybe I’m misunderstanding what you’re trying to describe. ETA: I mean, it doesn’t sound like that particular e-mail you described was an e-mail for a comment – just one for a new post. I believe we have some Paul Cornell fans in the audience? His upcoming book, Chalk, has a pretty cool cover and sounds very, very dark. And interesting. #1 Kelly Link’s Magic for Beginners is $1.99 at various U.S. outlets (Random House; has DRM). #2 Emperor of the Eight Islands by Lian Hearn is similarly $2.99 (FSG Originals; has DRM). I enjoyed but never got around to finishing Hearn’s “Otori” series (which ended, then later she wrote another book – yup, no series ever ends), so I’m a little intrigued. Anyone read this? @Bonnie McDaniel – If you go to https://wordpress.com/following/edit, you should see something like this under File 770. It sounds like you have the second option switched on – toggle that and things should be back to normal. An omnibus, titled SEED TO HARVEST, of Octavia Butler’s Patternist series (Wild Seed, Mind of My Mind, Clay’s Ark, and Patternmaster) is available for $1.99 today. Links for Kindle and for Nook versions. It’s also the….black-est (specifically American) representation that I think I’ve ever seen in the SFF genre (mind you, I don’t think that’s a very deep bench given what I consume regularly). Mindblowing music, and the history and names being dropped left and right…I’m gonna need a re-watch, with Wikipedia constantly open. There were so many references that I did not get, or could not distinguish if it was just a throwaway fictional reference, a comics-continuity reference, or something that referred to actual people and events in American history. TL;DR – Really good. Watch it. speaking of beautiful book covers … I want them all! You always tick the box you love. @Heather Rose Jones: Your work infested my dreams last night, I thought you’d like to know. I’ve been on a film noir binge lately, but also had occasion to recommend the Alpennia books to a friend. Later, I dreamed about reading a review in a sort of version of here about…maybe the 9th or 10th Alpennia book, set in the 1990s with Alpennia doing the same sort of post-Soviet struggle as Czechoslovakia. Now that I’m awake, I realize that it had a very Martin Cruz Smith feel, except with the magic. I really liked Flying Witch as well. Especially episode eleven with the flying whale which was very Ghibli-y. I do wish we had seen more of Chinatsu being trained, I was always half afraid that Akane was just humoring her. Midway through watching Luke Cage myself, so I appreciate the no-spoilers! Hasn’t grabbed me by the lapels like JJ season 1 did, but I’m enjoying it. I occasionally give thought to what would happen to Alpennia (and its world in general) as the industrial revolution progresses. But Alpennia is much too far away from the Iron Curtain for that particular scenario. I’ve already subscribed to File 770 as a site, so I automatically get notifications of new posts. The difference now is those notifications have been arriving with comments attached, when I couldn’t possibly have checked the comment Ticky box. This just started since Mike fixed the comments problem, so I’m assuming it had something to do with the update. It’s not an issue, obviously. To the contrary, I love it. I was just wondering if anyone else has experienced this. Also, I don’t and never have received an individual email for each new comment. (My inbox would be exploding if that was the case.) The comments notifications contain between 2 to 100 new comments for each thread, depending on when the notification is sent. @Heather Rose Jones: But Alpennia is much too far away from the Iron Curtain for that particular scenario. in which direction? “Iron Curtain” originally meant only the western boundary of the Soviet empire; is Alpennia somewhere else that it would be ruled (or leaned on, as other parts of the world were) by the USSR, possibly using eastern-European troops (similar to their bringing in far-eastern troops to crush the Prague Spring)? @Bonnie McDaniel: Funky! Yeah it sounds like the updates changed/improved (?) the new-post alerts. But why are you the only one seeing (noticing?) this…. Anyway, thanks, I did slightly misunderstand you. I managed to get the ticky-less notifications turned on using the link Bartimaus gave. There was an option to have regular digests rather than immediate notifications, so presumably that’s what Bonny has turned on. @Heather Rose Jones: [But Alpennia is much too far away from the Iron Curtain for that particular scenario.] in which direction? “Iron Curtain” originally meant only the western boundary of the Soviet empire; is Alpennia somewhere else that it would be ruled (or leaned on, as other parts of the world were) by the USSR, possibly using eastern-European troops (similar to their bringing in far-eastern troops to crush the Prague Spring)? Alpennia is located roughly at the intersection of France, Switzerland, and Italy, with a lot of handwaving around how it doesn’t disrupt the real-world geography of those countries while still managing to occupy space. To some extent, one of my models for the survival of an independent principality in that general region at that date was Savoy, and that informed a certain amount of why I situated it in that general location. So…quite a ways from any part of the Soviet bloc. Women Write And Edit A Hugo-Award-Winning Book, But A Man Gets Credit For It.